Uterine fibroids are an incredibly common diagnosis for women. In fact, out of every four women in America, three of them usually have fibroids during their lifetime. Only one in three women usually experiences symptoms, so it can easily go undiagnosed. Atlanta Fibroid Center. can help detect and treat uterine fibroids. Uterine fibroids are benign growths that form in the uterus’ smooth muscle layers. These growths are also known as myomas. Subserosal Fibroids — These types of fibroid tumors grow outward, as they form on the outer wall of the uterus. Because subserosal fibroids tumors cause pressure to be applied to surrounding organs, women who have them may suffer from pressure and pain in the pelvic area. These kinds of fibroids generally do not affect a woman’s usual menstruation patterns, considering the location of the growth. 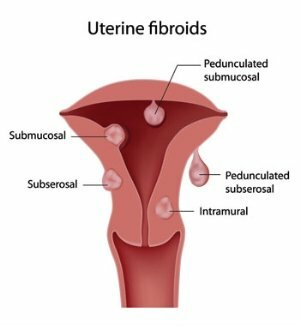 Intramural Fibroids — These are the most common types of uterine fibroids. They form inside the uterine wall and can cause the uterus to feel enlarged once they expand. A woman’s menstruation cycle can be impacted from an intramural fibroid tumor. For example, her menstruation cycles may last longer, and her menstruation flow may become excessive. She many also experience pelvic pain and the need to urinate more often. Submucosal Fibroids — Of all the different types of uterine fibroid tumors, submucosal fibroids are the least common. These tumors form below the uterine cavity’s lining, which can cause the fallopian tubes to be blocked. Because of that blockage, women who have these tumors may deal with fertility problems. There are also many other symptoms, such as heavier and longer menstruation. Pedunculated Fibroids — When a uterine tumor grows on a stalk and extends away from the uterine wall (either inside the uterus or outside the uterus), it is referred to as a pedunculated fibroid tumor. These types of fibroids tend to result in symptoms, which may include pressure and pain — especially when the tumor becomes twisted on the stalk. Besides causing pain and discomfort, uterine fibroids can become dangerous in the event they cause other medical conditions such as anemia. They can also affect fertility by changing the shape of the uterus or causing damage to it. It is not uncommon for women to have numerous fibroid tumors that are located in various parts of the uterus. In order to properly detect fibroid tumors in your uterus and fully understand how they are affecting you, you need to consult with a Atlanta Fibroid Center.